Filterra is an engineered bioretention system. 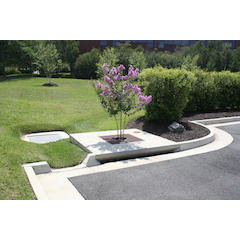 While it operates similar to traditional bioretention, its high flow media allows for a reduction in footprint of up to 95% versus traditional bioretention practices. Filterra provides a Low Impact Development (LID) solution for tight, highly developed sites, such as urban development projects, commercial parking lots, residential streets and streetscapes.